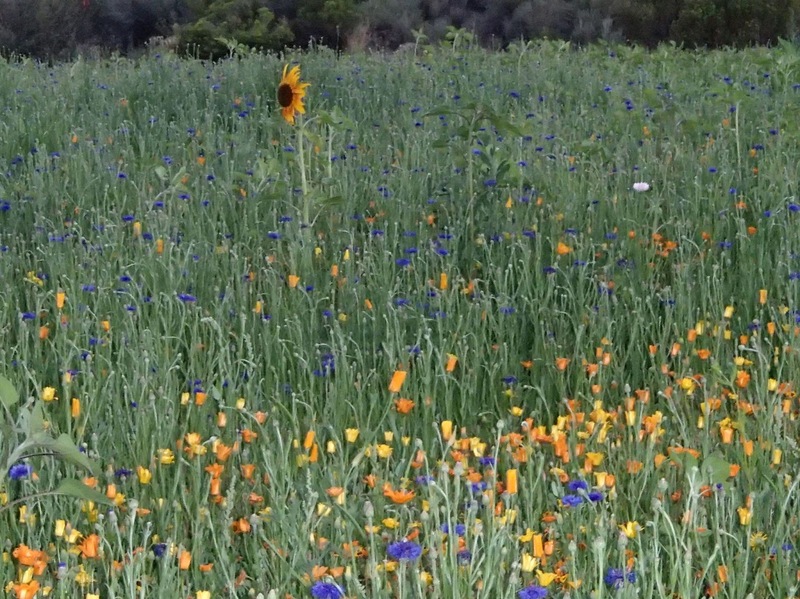 July 21, 2013 February 10, 2016 ~ Sara W.
I spotted this field of wildflowers on my way to a community event last night. I immediately noticed the sunflower sticking up amongst the flowers. It seemed to be such a powerful statement in so many ways; standing out above the rest, a ‘lone reed’ (Anybody else hear Frank Navasky’s line from You’ve Got Mail when they hear those words? ), or perhaps the idea of different but equal? The latter was the pressing thought in my head. Through a variety of situations this past week, I had the chance to contemplate why something being different often gets translated to it being bad. Surely, the photo above would debunk such thinking. The wildflowers and the sunflower are different, but they are equal in beauty. Most of us have been taught about such principles all our lives whether it was in a children’s cartoon, after-school special, or history book. Heck, before my girls were even of school age they had seen a Strawberry Shortcake movie that made it clear that new kids with different interests doesn’t mean they’re bad people. Strawberry Shortcake is a reliable source. Logically, I’d like to believe we all understand the concept. However, I feel like emotionally sometimes we’re not bringing the message home. I’m reminded of a test I had to take back at my first Full-time gig after college. It’s the Strengths Finder Test, originally put out by Gallup. Now they have a new and improved StrengthsFinder 2.0 book. In this book, you take a test to uncover your natural talents with the hope of utilizing those talents more in your daily life. The ultimate goal being to create a more fulfilling life. As it was explained to me at my company, we are not made up of weaknesses, but rather strengths that are more pronounced in some and less so in others. The idea that if we understood others strengths, perhaps we would all work together better? For those looking to dissect me, my Top 5 Strengths at the time, out of a list of 34, were Responsibility, Relator, Input, Belief and WOO (Winning Others Over). My absolute lowest strength was Competition. I’m certain my line-up would change if I were to take it now, a decade later. Keeping these strengths in mind, I reflect on a dear friend back in Southern California; where I lived my entire life up until 8 months ago. I met this friend seven years ago. While I enjoyed her company upon first meeting her, I can honestly say we did not “click” right away. We had much in common, but we also had a lot of differences. Differences that I guess kept me from nurturing the friendship. It wasn’t until 3 years after our meeting that she and I grew closer. I truly believe that the shift came when we acknowledged our differences and embraced our similarities. Not only did we acknowledge them, we teased each other about them in a loving way. We celebrated them. This friend had taken the same Gallup Strengths Finder test and, if I recall, three of my top strengths were at the bottom of her list of strengths and Competition was her top strength. Had I let our polar opposite personality strengths rule the friendship, I would not be fortunate enough to call her a dear and true friend now. It truly is a fascinating book, particularly that chapter. It addresses the impact that our cultural differences have on different aspects of our daily lives. Acknowledging those differences in a healthy manner, and perhaps incorporating those differences where appropriate, would do us all some good. I had a flashback this very moment of my first month of marriage. My husband was in our little apartment kitchen cutting an orange. To my shock, he was not cutting it the proper way. I felt the need to inform him of his erroneous ways. He kindly responded to my remarks with, “Just because I do it differently, doesn’t mean I do it wrong.” Ironically, I now cut an orange the way he cut it those many years ago. All these random thoughts aside, the real inspiration for this post was my realization this week that it’s okay to be different. I knew that on a larger scale, but I don’t think I had comfortably applied it to my individual personality. It’s tough when people don’t behave or respond to situations the way we would or feel they should. I’m certain I’ve offended many a person with strengths of my own that were not appreciated by those with a different set of strengths. A simple example being that one of my top strengths is a Relator, a person who thrives on close intimate relationships. The Includer strength, someone who looks to draw others in so that they can feel the warmth of the group, was towards the bottom of my list. I have been the kind recipient of many a sweet Includer, but sadly it is not my natural strength. I find smaller gatherings more meaningful and fulfilling. As a result, I don’t always expand the circle as others might. I’m finding that I’m growing more comfortable with who I am. It must be one of the perks of maturing. It’s finally starting to feel okay for my strengths to be what they are instead of comparing myself to the strengths of others. Different is okay. As with my friend back in SoCal, whom I miss more than I was prepared for, I hope to find more joy in recognizing differences, incorporating them as appropriate and, above all, celebrating them. < Previous Can You Get Yourself All Wrong?